The Ministry of Antiquities has announced the shortlist of companies and consortiums that have been selected to enter the open tender to manage the facilities of the Grand Egyptian Museum (GEM) complex, scheduled to open in 2020. Major General Atef Moftah, head of the GEM Engineering Committee, told Ahram Online that the shortlist was selected after the concerned committees led by Tarek Tawfik, the GEM's supervisor general, had accurately examined the documents submitted by all the companies. He said that the committees selected four joint Egyptian-international consortia and one single company to enter the open tender, to select the entity to manage the GEM facilities. The four consortia includes an Egyptian Italian consortium of Al-Kharafi National, Fabbro and Munus; an Egyptian-American consortium of Hassan Allam Construction with Jones Lang and Lassalle; an Egyptian-French consortium of Orascom Investment, the Louvre, GFM, Gl event, RMN and Engie; and an Egyptian-British consortium of G4S, the Egyptian Investment and Project and Development and Samcrete. The fifth selected entrant is MAB company from the UAE. Moftah said that contractual procedures for the GEM facilities management are scheduled to be completed in the fourth quarter of 2019. Tawfik explained that facilities include a 1,000-seat conference centre, a 500-seat cinema, 10 restaurants, with two overlooking the Giza Pyramids, food courts, bookshops and other retail outlets, a traditional arts and crafts centre, and a multifunctional building that could be for administrative purposes or as a boutique hotel. He underlined that the Ministry of Antiquities is the only authority responsible for the management and security of GEM's treasured collection, as well as anything related to antiquities, such as exhibition halls, the maintenance and restoration centre, and the children's museum. The GEM complex is a cultural institution located on an area of approximately 500,000 square metres adjacent to the Giza Pyramids. 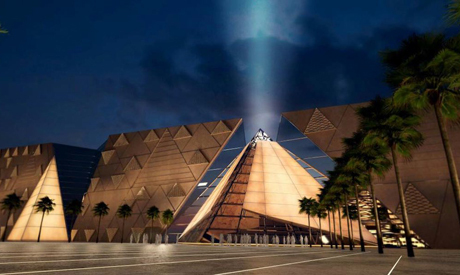 The museum will contain over 100,000 artefacts, reflecting Egypt's past from prehistory through to the Greek and Roman periods, in an area of 92,000 square metres. In June, the Ministry of Antiquities in collaboration with the Ministry of Investment and International Cooperation announced the opening of the application stage for companies bidding to run the GEM facilities. In August, at the request of the applying companies, the ministry extended the pre-qualification period for interested parties to submit documents.